After decades on the road, the Osmond brothers are getting ready for their last concert tour in the United Kingdom. 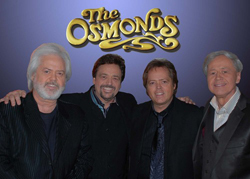 The Osmonds' 50-date "Up Close and Personal Tour," their last in the UK, runs March 9 to May 6. Jimmy Osmond has become quite a star in Britain, appearing in West End revivals of "Grease" and "Chicago," touring "panto" plays (it's a British thing - there's no way to explain it), and appearing on British reality TV shows.